As a nutritionist, I’ve been telling people what to eat for years, so I thought that when it came to feeding my own child I’d feel like a pro. But no! When I introduced my kid to solids, I suddenly felt like I was working my way through a new kind of wilderness. The mom guilt is real, ya know? If you’re raising vegetarian kids, it can seem even more daunting, especially since we are making most of the choices about what ends up on their plate (what ends up in their stomachs is another story). Is there enough variety in their diet? Am I giving them enough protein? What about iron? And B12, are they getting enough of that? What about DHA and other omega-3 fatty acids that are so important for a growing brain? It can be overwhelming at the best of times! But know this: lots of kids are insanely picky eaters, vegetarian or not. There are plenty of kids out there who are eating super limited diets they’ve created themselves, like my friend’s son who ate nothing but cereal for several years, and somehow, they turn out just fine. Of course, we should try to feed our kids the most balanced and nourishing diet possible. But don’t let raising vegetarian kids scare you – it’s totally doable in a healthy and balanced way. Just be mindful of some nutrition basis and offer a good variety, and you’ll do a great job. It’s important to let your pediatrician or family doc know that your child is eating a vegetarian diet, so that they can test iron levels from time to time. Iron deficiency can lead to low energy and cognitive defects over time, but the good news is that it’s easily avoidable. 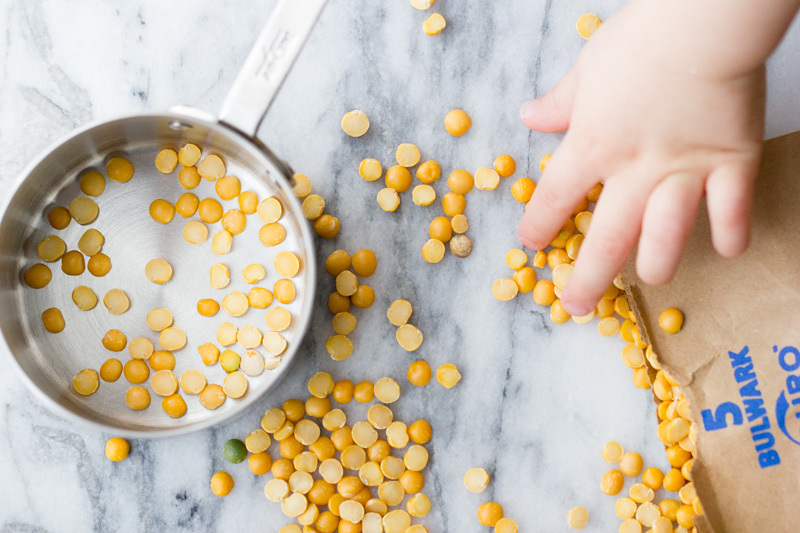 Be mindful that non-heme (plant-based) sources of iron are absorbed poorly by the body (2-12% vs 25-40% for heme iron) so you may need to include extra iron-rich foods in the diet to meet the recommended intake of 7mg for kids 1-3 years old. The best plant-based sources of iron are legumes, lentils, beans, tofu, pumpkin seeds, and iron fortified cereals. Egg yolks are also rich in iron if you’re not vegan. Avoid serving calcium (like dairy products) and iron at together, and serve alongside a source of vitamin C to optimize absorption. Protein is important for growing bodies and growing brains. Current recommendations suggest that growing kids need roughly 1-1.5 grams of protein per every kilogram (2.2 pounds) of body weight. Recent research has suggested that protein recommendations may have been underestimated, and although this research applies to adults, one can assume that children would also benefit from extra protein. Good sources of protein include beans, tofu, nuts, seeds, eggs, yogurt, cottage cheese, and quinoa. If you prefer to use plant-based milks, note that most plant milks contain around 1 gram of protein per cup vs. 8 grams of protein per cup of cow’s milk. Some exception to this are soy milk and pea milk, which are also 8 grams of protein per cup. Zinc is vital for a well-functioning immune system. It can be tough to reach the recommended daily intake of 10 milligrams of zinc on a vegetarian diet, so it’s a good idea to discuss this with your doc and decide on whether a supplement could be necessary. Plant-based sources of zinc include chickpeas, beans, tofu, artichokes, and fortified cereals. Good news! It’s actually fairly easy to get a good amount of calcium on a plant-based diet. Tofu, whole grains, collard greens, kale, spinach, and figs are all good sources, and there are many fortified options including orange juice and fortified plant-based milks. The recommended daily intake of calcium for kids 1-3 years old is 700 mg. Depending on where you live, it’s recommended that all kids take a daily vitamin D supplement. Since this is a fat-soluble vitamin and we store it, small kids need to build up a reserve. If your veggie kid isn’t having dairy products fortified with vitamin D, they should definitely be taking a supplement. Vitamin D3 is the form most readily absorbed and used by our bodies, but as it is extracted from oils on sheep’s wool, many don’t consider it to be vegan. Vitamin D2, while not used as efficiently by our bodies, is totally vegan. The recommended daily intake of vitamin D for kids 1-3 years old is 15 mcg. Omega-3 fatty acids are vital for growing brains. In particular, DHA is critical for brain development. Children get it first from breast milk or formula (a DHA supplement is important for vegetarian mamas during pregnancy and lactation for this reason), but after weaning children need to get a reliable source. For those who eat eggs, egg yolks from pasture-raised hens are a good source, or those that are marked as omega-3 fortified eggs (this means the hen’s feed has been fortified). There are some good plant-based sources of ALA, including chia seeds, flax seeds, and walnuts, which our bodies are able to convert to DHA, but the conversion from ALA to DHA is not very efficient, so particularly in vegan kids, a DHA supplement is recommended. Traditionally fish oil has been the go-to DHA supplement, but these days there are some good quality algae oils available as well. The American Dietetic Association recommends an average of 500mg of total EPA and DHA per day. Vitamin B12 plays an important role in brain development and function, as well as cell metabolism and DNA synthesis. Vitamin B12 is found in most animal foods, including meat, fish, eggs, and milk products. Other than some fermented foods, there are very few non-animal food sources of biologically active B12. But, many vegan foods are fortified with vitamin B12, including non-dairy milks, breads, cereals, meat substitutes, and some types of nutritional yeast. The recommended daily intake of B12 for kids 1-3 years old is 0.9 mcg. The above list is far from exhaustive, but consider it a good starting point for raising healthy vegetarian kids. It’s a good idea to speak to your health care professional about any potential supplementation, and monitor levels of important nutrients like iron and B12 carefully. Remember, too, that your kid’s needs will grow along with them, so be sure to check the guidelines for different age groups.